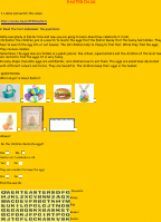 3 exercises to help ss remember Easter vocabulary. Suitable for very young learners as well as adults (beginners). PPT and a ws are also available on today�s contributions. 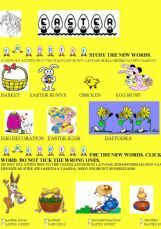 Find ten words about Easter. 3 exercises suitable for kids as well as adults. Can be used as self-study resource. 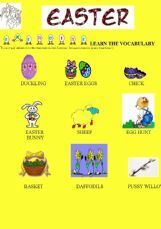 Very simple activity to teach some Easter vocabulary. Two suggestions of activities to help memorizing vocabulary. Start online and finish at the notebook. 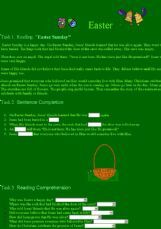 A quizz to review Easter traditions in a fun way. The game goes with the flash card (publish as 3 .ppt files) and a youtube video. A bible passage about Jesus being betrayed by Judas in the Garden of Gethsemane. 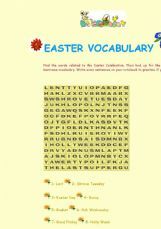 A cloze activity, multiple choice, crossword and wordsearch.